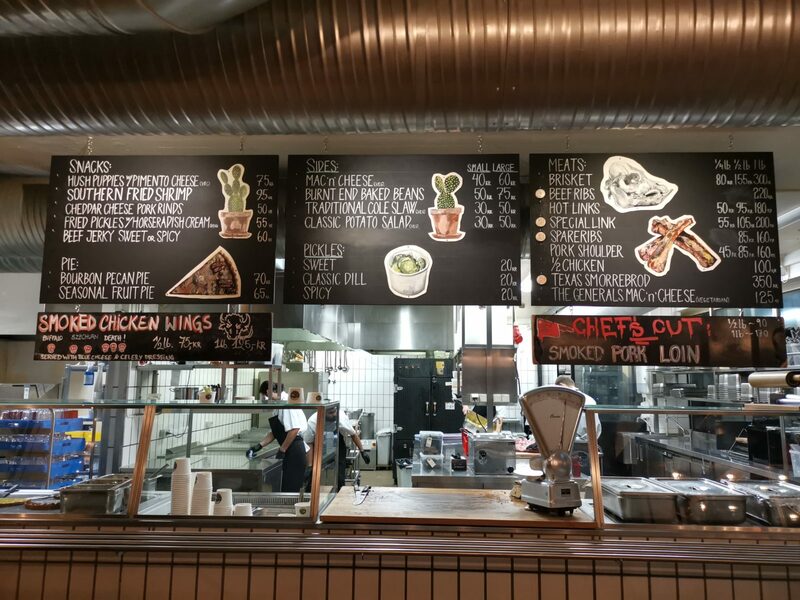 I saw Warpigs on a Netflix food show, starring American hip hop star Action Bronson not too long ago and when we booked a trip to Copenhagen I put it on my hit-list of places to visit. 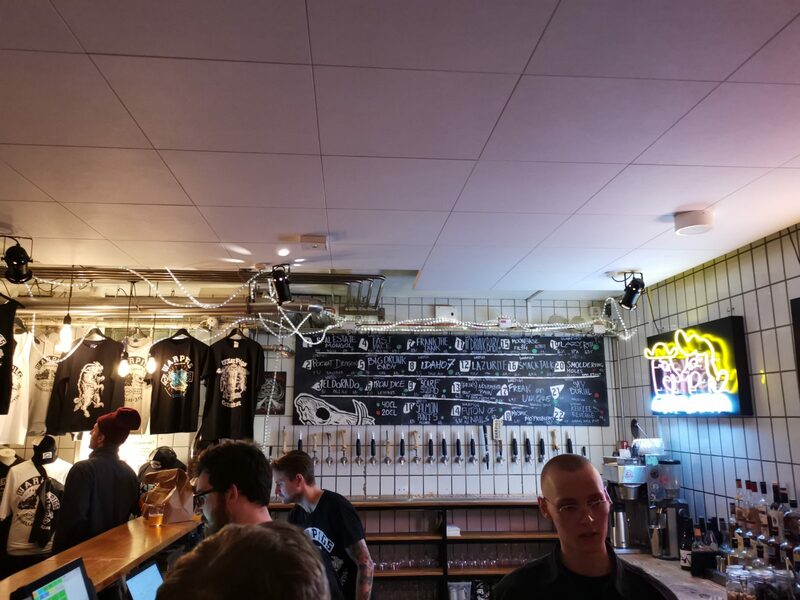 I didn’t realise at the time that the venue was a collaboration between one of my favourite Danish craft brewers Mikkeller and the American 3 Floyds brewery. 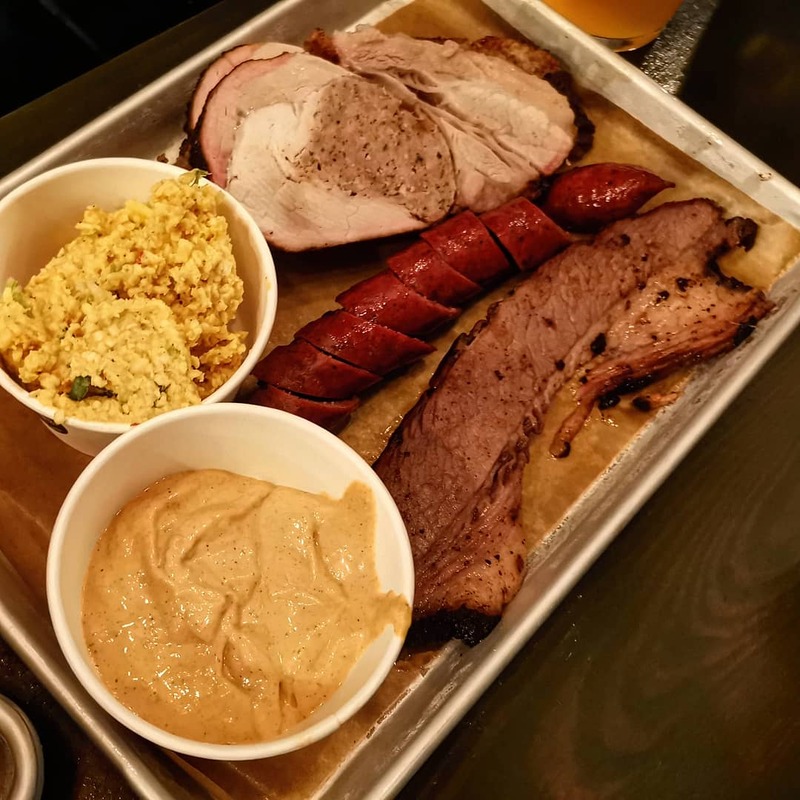 The location of the Texas BBQ and brewpub was quite fitting, as it was located within the old meat packing district in Copenhagen. The expansive series of buildings has become a mecca for good food and drink in the city in the past few years. From a restaurant point of view, the buildings already have everything you need to setup shop with with the sterile environment and white tiles, which we noticed haven’t been altered much in most of the venues when we walked past. We were staying less than a 10 minute walk from the meat packing district so we took a stroll over to see what else was about. 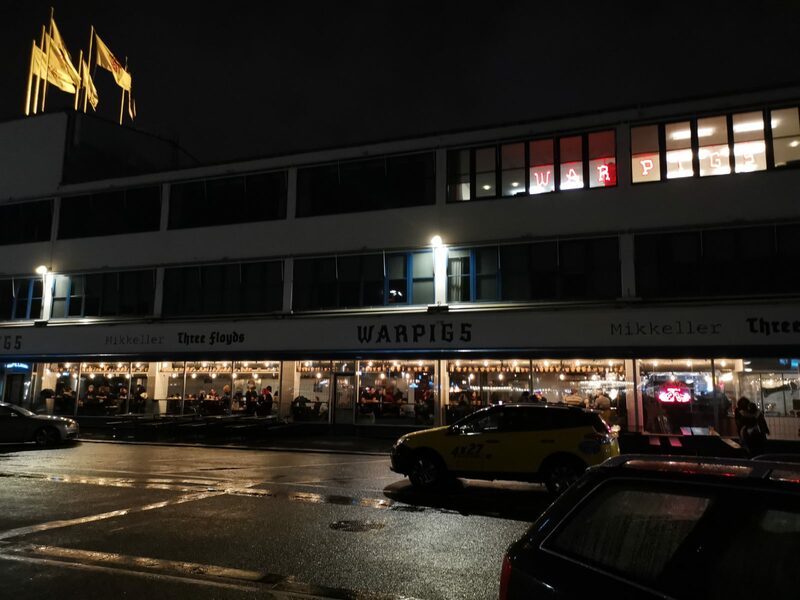 The Warpigs brewpub looked huge from a distance but it is long and narrow from inside. They also have a merch and bottle shop next door, which had shut shop for the day by the time we got there. There’s a communal dinning vibe going on with long tables in rows and some tables laid out across the length of the window to the outside, which suited smaller groups and couples. We managed to nab one of these seats pretty much straight away, considering it was rammed in there. There’s no table service so you have to order your drinks, consisting of over 20 Warpigs special beers, so you know your getting something totally different, which you won’t get anywhere outside of the venue. I went for a 6.8% Frank the Tank IPA and Llio going for the only sour on the menu at the time. They don’t do full pints and are more akin to an Australian scooner at 400ml for a large and 200ml for a smal or half. They were slightly high on the ABV, both being around 7% mark and they came to 131DKK or £16 in English notes. Not cheap, but then I’m surprised they don’t charge you to breath in Denmark as prices are outrageous everywhere. For the food, you have to go up and order and it’s a bit like the school canteen, where you get a metal tray, tell the server what meat and what weight you want. They then weigh each item of meat in front of you and add it to the tray. Same goes for sides but these are per pot size, so no weighing involved. I had to have two trays to fit our food on as I went a bit nuts on the sides. The cost of the food alone came to 605DKK, around £73.50. Again not cheap considering we only had 4 meats and the smallest portion they did but then it is Copenhagen prices. We both enjoyed the food, with the meat both tender and full of flavour. I was probably more into the sides as I love little nibbles but the meat we did have was damn tasty. Sadly they had run out of a few things I tried ordering like the pork ribs and special hot links but there was plenty of other things to choose from. These included the standard hot links and another pork special of smoked loin instead of the ribs, which had a nice crisp to the crackling. Also on the menu was beef rib, which would have been a contender had I not ordered the brisket but I’m not a great fan of ordering by weight when you’ve got a Jurassic proportion bone sticking out of the meat. It was also the most expensive meat per weight on the menu. It was an absolute onslaught of food to be fair and I was left feeling a bit sorry for myself about 15 minutes in, after letting my eyes get the better of me when ordering. I’d have two minutes breather, a little burp then attack the smoked feast again before failing again. We managed to fill two of the little paper bags with bits to take back home with us for a packed lunch instead of wasting it too, which was handy. I’d probably not need to eat for at least two days after what i’d just eaten mind. I did like here, from the relaxed dinning, extensive beer list and just because I’m BBQ craving, smoked meat loving fiend. I couldn’t fault any of the food we had, apart from a slight issue with not getting my chicken wings and only realising part way through our meal. After showing them my receipt, they threw them straight in the fryer and were ready within minutes. The cost of £73 just for food seemed a bit steep at first but in the grand scheme of the cost of everything in Copenhagen, it wasn’t too bad. 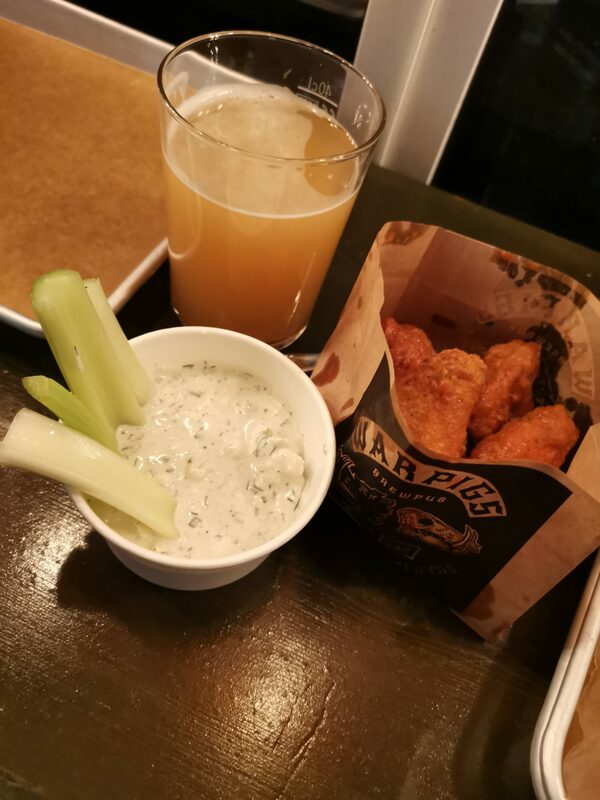 If you’re visiting Copenhagen I would definitely recommend a visit to Warpigs, if not for food then they are equally equipped to satisfy your fermented hopped needs with over 20 own brewed beers on tap.